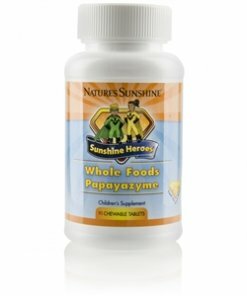 Nature’s Sunshine Sunshine Heroes Whole Foods Papayazyme is a digestive enzyme supplement for children that combines enzymes from pineapple and papaya fruits, and is fortified with additional enzymes like proteolytic amylase. The digestive enzymes in Sunshine Heroes Whole Foods Papayazyme help break down food into nutrients for maximum absorption and use for all the various body systems. 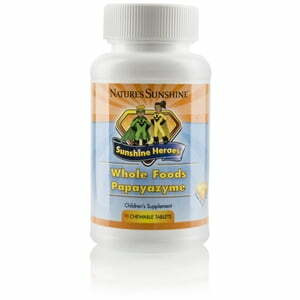 Nature’s Sunshine Whole Foods Papayazyme provides digestive enzymes at levels that are safe for chewing and gentle enough for children.